For some (if not many) Christians, finding and enjoying the assurance of their salvation is a painfully elusive venture. Although there may be evidence in a person’s life that strongly suggests they are a believer—evidence confirmed by trusted friends and pastors—a robust sense that they truly belong to God seems to regularly evade their grasp. As a result, these struggling Christians find themselves returning to the mire of past sin, unable to wage effective warfare against their illicit thoughts and desires, and consequently finding themselves largely unproductive and unfruitful in their Christian life. Unfortunately, such a pattern usually only gets worse before it gets any better. Because a person who lacks assurance is usually unable to battle successfully against sin, their failure in this area typically provides even stronger evidence that they have, in fact, not been saved. If this pattern is allowed to progress indefinitely, a lack of assurance will come to characterize this person’s life and render them largely unprofitable in their walk with Christ. Assurance of salvation, then, is a matter of first importance. It is vital, however, to ground one’s assurance in the proper place. On the one hand, a person wrestling with assurance may be tempted to rest only on particular promises, like those found in John 5:24, “Truly, truly I say to you, whoever hears my word and believes him who sent me has eternal life. He does not come into judgment but has passed from death to life.” While it is appropriate to place hope in these kinds of promises, it is unwise to rest on these promises in such a way as to rule out other important verses, like those found in I John 2:3-4, “And by this we know that we have come to know him, if we keep his commandments. Whoever says ‘I know him’ and does not keep his commandments is a liar, and the truth is not in him.” There is a kind of assurance that deceives a person into believing they know Christ when the reality of their life proves otherwise. Yet, there is another temptation for those who are struggling with a lack of assurance. Unlike the person who rests solely upon the promises of Scripture and does not take account of the kind of life they are living, another person may begin to focus exclusively on their faith and obedience, forgetting to look to the work of Christ on the cross or to the glorious promises made in the gospel (like John 5:24). This person, by only looking to their faith and obedience, has, ironically, cut themselves off from the source of genuine assurance. If they continue to look only at their faith and obedience, they will never enjoy a deep and abiding sense that they belong to Christ, for either they will despair at their indwelling sin and imperfect obedience, or they will disregard the seriousness of their sin and lapses of faith. In either case, this person is far from what Scripture calls “the full assurance of hope” (Hebrews 6:11). True assurance not only takes into account all the relevant truths about salvation; it also places these truths in their proper order. In other words, it is not enough for pastors and teachers to encourage those struggling with assurance to believe in Christ’s work and to examine their lives—they must show their people how much weight is to be given to each aspect of salvation in one’s search for assurance. This is best demonstrated with the use of a simple diagram. In this diagram, you will notice that God’s work of salvation in Christ provides the foundation for the remaining facets of assurance. Each remaining aspect not only rests upon the prior aspect (and ultimately upon the foundation—God’s work of salvation in Christ), but each tapers slightly compared to the prior aspect. Thus, God’s work of salvation in Christ provides the foundation for all the other aspects and is ascribed the greatest weight in determining our assurance, while lesser weight is assigned to the others. That greater and lesser weight is assigned to specific facets of our salvation, however, does not suggest that any part of this diagram is dispensable; every component is essential in order for a person to find and enjoy real assurance of salvation. Although lesser weight is assigned to our faith and obedience than, say, Christ’s intercessory work on our behalf, we cannot enjoy true assurance unless we take account of our lives. Nevertheless, those who are tempted to place too much weight on their faith and obedience will observe that self-examination comes last and is dependent upon other significant and more foundational facets of assurance. Pastors, therefore, must labor not only to provide their people with the raw data of Scripture; they must also work diligently to place each truth in its proper theological context while helping their people understand how each doctrine fits with and relates to other biblical truths. Faithful exegesis of biblical texts is necessary but (as we’ve seen above) not sufficient for the task of providing people clear insight into the whole counsel of God. Sharp analysis and commentary on given passages must be joined with careful theological synthesis and attention to doctrinal proportion. It is not enough to expound on the glories of Christ’s work on our behalf if our people are left thinking that their obedience contributes equally to their sense of assurance. Nor is it helpful to exalt the many promises of the gospel to the expense of the biblical call to obedience. Practically, this means that pastors should not only avail themselves of commentaries and exegetical tools; they should stock their libraries with reliable theological resources written by men who have labored long over biblical texts and pondered how each text relates to complements every other text of Scripture. It may also mean that we will need to read more theology and meditate longer over the broader context of Scripture–perusing large portions of the Bible to shed light on our preaching text–in preparation for Sunday. Hard work? Yes. But our people’s assurance–and thus, their fruitfulness–depend on it. 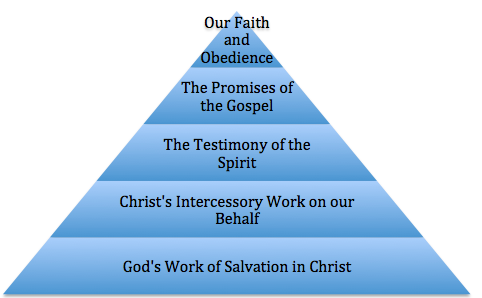 I am indebted to Dr. Gregg Allison, Professor of Theology at the Southern Baptist Theological Seminary, for his idea of a pyramid diagram to help explain the order in which we should understand the different facets of assurance and how they relate one another.